Durham, NC, Sept. 25, 2015 - In the quarter-century since it started as a small, church-based program, StepUp Ministry has helped thousands of people find jobs and build stable lives. Now an independent nonprofit, StepUp helps people who are coming out of prison, are homeless, or otherwise in need of a fresh start. It’s an intense program, helping only those willing to devote serious time and effort by training them in every aspect of finding and keeping a job, managing their finances and navigating the many problems that can derail their progress. And it’s a growing effort. Two years ago, the Raleigh-based program launched a Greensboro office. This year, with help from benefit concerts hosted by Band Together, the group raised $2 million to expand further. 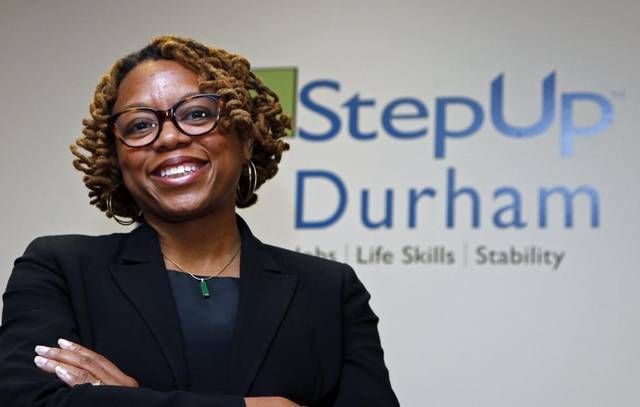 Syretta Hill, 42, is heading the latest expansion for StepUp, which will open its new Durham office next month, aiming to place 250 people in jobs within the next nine months. She previously worked as a community organizer with Habitat for Humanity of Wake County. Tim Wollin, who joined the new Durham team after working for StepUp in Raleigh, says Hill has been able to form key relationships to make the organization’s newest iteration a success. Hill grew up in northwest Florida, where her parents both held master’s degrees and worked in the prison system – steady jobs, Hill says, that she sensed were not as satisfying as the volunteer work they did after retirement. Hill says her work with Habitat, and now StepUp, helped her to find that kind of personal satisfaction with her job. But she wasn’t always destined for nonprofit work. She finished high school in Tallahassee and earned a scholarship to attend the University of South Florida in Tampa, where she earned a degree in communications. From there, she joined her father, who was living in Philadelphia, where she worked for a local school district and later a small publishing company. When that company downsized, she moved to Raleigh, where her mother lives, and started with Habitat Wake. She started out doing family support, helping the recipients of Habitat homes to work out their other problems, including child care, food and transportation. Later her role would expand to include community-wide programs. Part of a national movement within Habitat for Humanity, these neighborhood revitalization efforts were meant to build lasting community networks that promote safety, wellness and economic development in low-wealth neighborhoods. “You can build a house, but if the community around it isn’t thriving, you’ve done a disservice to that family,” Hill says. Throughout that time, she was forging ties with all kinds of community groups that focus on specific needs. She became a board member at Wheels4Hope, which fixes up donated cars and provides them at low cost to low-income workers. She also worked with the City of Raleigh on park projects, earning her a volunteer award earlier this year, and volunteered with Jobs for Life, a nonprofit devoted to job placement. Another group she worked with was StepUp, where she would refer people to the jobs and life skills programs. When she heard of the opening in Durham, she was eager to take the leap. StepUp was founded as a temporary housing program within White Memorial Presbyterian Church and has grown over the years into a well-regarded nonprofit with an operating budget that has reached nearly $2 million. The group conducts a weeklong jobs program and a yearlong life skills program as well as programs that focus on young adults and the children of participants. Participants in the jobs program attend workshops aimed at every aspect of finding a job – matching their skills with employers, creating resumes and filling out applications, and conducting mock interviews. They are also outfitted with professional clothes through several area nonprofits, and leave with a suit, a resume and job leads. For the life skills program, participants commit to a full year of weekly meetings, working closely with counselors and volunteers on skills including financial literacy and controlling their emotions. StepUp also matches up to $10 a week to help them build their savings. Last year, StepUp helped connect more than 300 people with jobs; in its history, that number exceeds 2,500, and its graduates are known for their ability to keep jobs. Moving forward, the group aims to open more branches and will use some of its expansion budget to create a central office overseeing the growing local offices. Hill expects about 75 percent of the Durham program participants will have been involved in the criminal justice system in some way. Baqir Mujahid, an employment counselor at the new office, says the need among this population is great in Durham. He struggled to find work for years after he was released from prison, despite training for several different careers. Without jobs, says Mujahid, many ex-convicts return to crime to make a living. He eventually went to StepUp, and says the approach is far more effective than most job-placement programs because the program works so closely with the participants to both prepare them for work and help them find the right job. “They address all of the different challenges,” says Mujahid. For Hill, the past few weeks have been all about learning. She’s conducting meetings nearly every day with community leaders in Durham and says she has found a number of partners eager to work closely with StepUp. She says she’s fallen in love with the town and plans to move her own family there soon. As part of her preparation, she also attended a weeklong job placement class in Raleigh, where she saw the StepUp model at work firsthand. Fun Fact: Habitat afforded her a chance to travel, first as part of Habitat home-building projects in Honduras. Later, she was awarded a Marshall fellowship, which took her to five European countries as part of a program to increase international cooperation.